Wilder, ID – Mr. Harry Hukkinen, Art Teacher K-12 Wilder School District, was recently invited to submit an artwork paying tribute to Hassan Sharif, a man “recognized as a pioneer of conceptual art and experimental practice in the Middle East.” Sharif passed away September 18, 2016. Mr. Hukkinen was fortunate to have spent time with Hassan during graduate studies at the University of the Arts, under the directorship of Joe Girandola. In 2011, a group of MFA candidates were invited to submit work for the 29th Annual Exhibition of the Emirates Fine Art Society. Those selected were invited to the UAE to install the work at the Sharjah Art Museum and tour the Flying House, a Dubai institution for promoting contemporary Emirati artists, co-founded by Sharif in 2007, where Sharif extended his mentorship role to the visiting artists. An exhibition entitled, “Missing Objects”, will be held in Hassan Sharif’s honor at the Flying House, during the month of March, 2017. Curator of the show, Cristiana De Marchi, requested that the participating artists, create an artwork that reflected their relationship with Sharif. Mr. Hukkinen, impressed by Sharif’s selfless devotion to his students, reflected on commitment and support of other artists and was inspired to create a submission from Wilder School District’s student artwork. Middle school and high school students drew black ink art designs on one inch paper squares. Sixty-four squares were selected and transformed into a single unified composition, entitled, “31 Students”. Mr. Hukkinen is a firm believer that art is a universal language with the ability to transcend language and cultural barriers and that artists need to continually create opportunities for students to experience this. 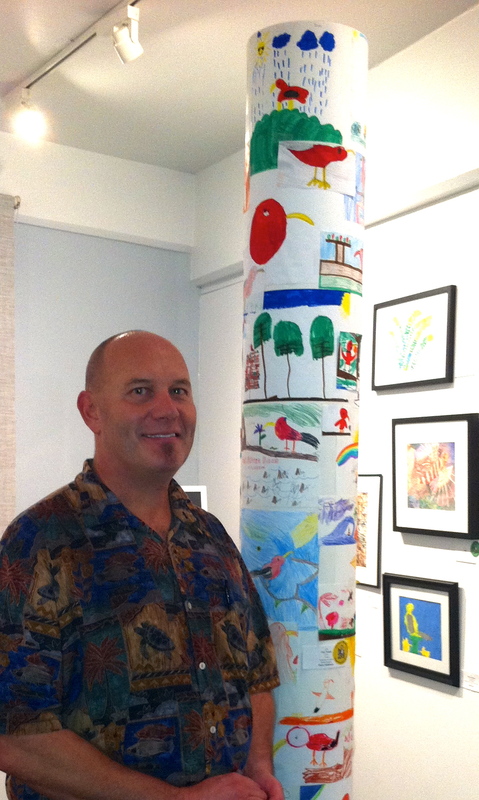 Harry’s classroom project, ‘I’iwi Totem, received 1st place in the Wailoa Arts and Cultural Center’s Hawai’i Nei 2013, held November 1-29, 2013. A big thank you to all of my backers on Kickstarter! Denise Philipbar, Matti and Ritva Hukkinen, Pat Paradowski, Stacy Harrington, Simo Muinonen, Jim Bogardus, Michele Kishita, Robert McKay, Kevin Fricovsky, Janine Hughes, Michael Connick, Andrew Cameron Zahn, Sarah Nguyen, Beth Lorber Scher, Amy Felton-Toth, Robert Toth, Big Jack Felton, Mike Richison, Lee Stoetzel, Anne Massoni, Peter Meng,Eric Toscano, Kathy Lorenzo, Arlene Ullrich, Tony and Teddy Mason-Sherwood! I am very excited to begin installation of my contemporary interpretation of the Finnish fish trap called a Katiska. The installation will be in human scale and invite physical participation from my audience. It is the shape of Katiska that confronts and exploits the innate and primal curiosity of the living, which often ends in an inescapable consequence. I hope to see each one of you soon! The University of the Arts MFA Class of 2012, visited contemporary art lover, Steve Shane, during our recent visit to NYC. We had a wonderful time and it was definitely a highlight of the summer.